Arkansas Foods Make Great Gifts. The whole Arka-vore movement and an assignment from the Arkansas Times turned me to thinking of the holidays a few months early this year. For weeks, I compiled lists of places to go and items that bring the flavor of Arkansas to the recipient. Lots of places to pick up things and places that sell great things online. The Arkansas Food Gift Guide can be found here on the Arkansas Times website. Here are some of the other great places I found that had to be cut because of space. ARGENTA MARKET/CERTIFIED ARKANSAS FARMERS MARKET. Just because the harvest is over, doesn’t mean you have to go without fresh Arkansas-raised vegetables and fruit for the winter. Arkavores rejoice: fresh produce and products are available year-round through the Certified Arkansas Farmers Market online. You can go on the website to find out what’s available and set up for a Saturday morning pickup. Here’s where you’ll find things like pecans, sweet potatoes, Arkansas black apples, dairy products and eggs, all grown here in-state. Better yet, gift your loved one with a Basket-A-Month subscription; each month, the recipient will receive an email to confirm a pickup of a basket containing fresh eggs, milk, produce and more. A gift that lasts three months or more and which helps Arkansas farmers and producers. RANGE: Basket-A-Month is $180 for three months; more months may be purchased. ONLINE: http://www.arkansasfood.net/for Basket-A-Month, cafm.locallygrown.net for shopping. PHONE: email for number. PICKUP: By arrangement & at 6th & Main in North Little Rock on appointment. BROWN SUGAR BAKESHOP. Want decadence to add to your holiday dessert table splendor? Drop by the River Market and order up cupcakes, brownies and cookies to take home and share or gift. Holiday flavors include Chocolate Peppermint Chunk Cookies, Cranberry-Orange Mini Muffin Loaves, Eggnog Cupcakes and Sweet Potato Blondies. Or go for anytime favorite Limoncello. RANGE: $1.75-$3 for most items. 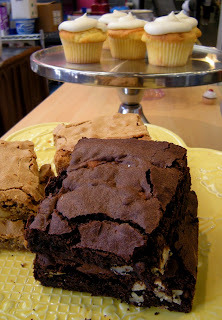 ONLINE: http://www.brownsugarbakeshop.com/. PHONE: (501) 372-4009. STORE: In the Oppenheimer Hall at the River Market. CAVENDER’S. So popular, no Southern kitchen really should go without it. The Greek seasoning is so pervasive in my family, a steak without had better have a good excuse for existing. Peppery without being spicy, it brings a familiar and robust flavor to beef. Try it with lemon juice on catfish. RANGE: $2.25 for 3.25 ounces retail, or order it to be shipped to the one you love at $15.50 for a four pack. ONLINE: http://www.cavendersseasoning.com/. PHONE: (870) 741-9566. PICKUP: Almost any self-respecting Arkansas grocery store. COPPER GRILL AND GROCERY. Take-and-make dips, sauces, casseroles and desserts downtown. 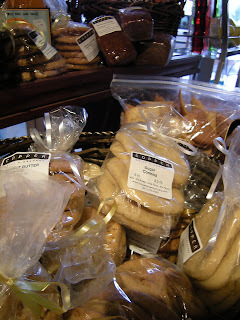 The sugar cookies have caught my eye as a great stocking stuffer, along with Little Rock Rocks (decorated candies). ONLINE: http://www.coppergrillandgrocery.com/. PHONE: (501) 375-3333. STORE: Third and Cumberland in downtown Little Rock. COTHAM’S. 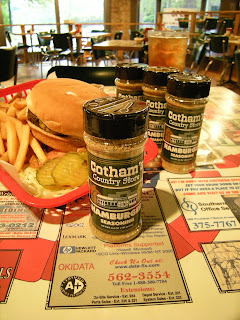 If you’ve ever had a Hubcap Burger out in Scott at the Mercantile or in-town at Cotham’s in the City, you’ve brushed elbows with the fabulous Cotham’s Hamburger Seasoning. Enjoy the peppery goodness on your burger (or even fries!) in your own home with this simple yet strangely elegant spice blend. RANGE: $4.95 for six and a half ounces… it’ll go pretty far. ONLINE: http://www.cothams.com/. PHONE: (501) 370-9177. STORE: 1401 West Third in Little Rock or right on Highway 161 in Scott. PICKUP: Gifts of Arkansas, River Market Grocery. DIANE’S GOURMET LUXURIES. You won’t really find any deals there, but that’s not why you go to Diane’s anyway. You go for the great selection of gourmet products, both from Arkansas and around the world. You go for take-and-make meals that rival high-priced restaurants. You go for just-like-homemade desserts. My particular recommendations: Diane’s Watermelon Pickles (I swear that’s a stolen family recipe) and Cheese Pecan Wafers you purchase in a frozen tube and slice and bake at home. 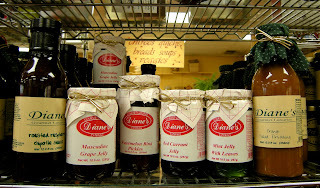 ONLINE: http://www.dianes-gourmet.com/. PHONE: (501) 224-2639. STORE: 11121 North Rodney Parham (in the Market Street Shopping Center). EGGSHELL KITCHEN COMPANY. Carries lots of Arkansas products, both food items and cookery items, along with cookbooks (such as the nifty Junior League of Little Rock’s “Big Taste of Little Rock” cookbook) and just about anything you need in a kitchen. 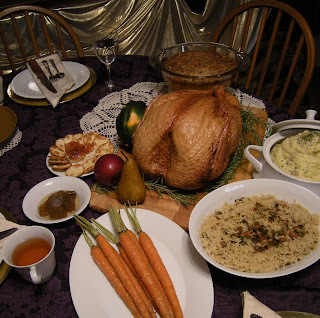 Consider purchasing gift certificates for cooking classes offered by Arkansas chefs for the gourmand in your household. ONLINE: http://www.eggshellkitchencompany.com/. PHONE: (501) 664-6900. STORE: 5705 Kavanaugh in the Heights. FISCHER. 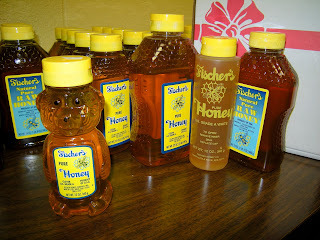 As far as I know, Fischer Honey was the first I ever tried, out of that translucent yellow-topped bottle with the honeycomb on it. It’s still fantastic. You can only pick up Fischer gift baskets at their headquarters in North Little Rock; individual bottles are sold in the store. RANGE: ~$12 for a gift box, $2.36 for a 12 ounce bottle. Retail varies. ONLINE: http://www.fischerhoney.com/. PHONE: (501) 758-1123. STORE: 2001 North Poplar in North Little Rock. PICKUP: Most Arkansas grocery stores. FLOSSIE’S FUNNEL CAKES & COTTON CANDY. Bring festival season to your holiday stocking with the new pre-packaged (and shelf stable) cotton candy. Funnel cake and corn dog mix, ring and funnel kits for home use. RANGE: Ring & funnel kit $9, funnel cake mix $7, cotton candy varies. ONLINE: Funnel cake mix & gear at http://www.flossiesfunnelcakes.com/, cotton candy at http://www.flosszone.com/. PHONE: (800) 844-3567 PICKUP: River Market Grocery. PANCAKE SHOP. Ever been to the nearly 70 year old Hot Springs mainstay? No? Where have you been? The plate-sized pancakes come in stacks if you really want a stack, but most folks give up after one or maybe two. 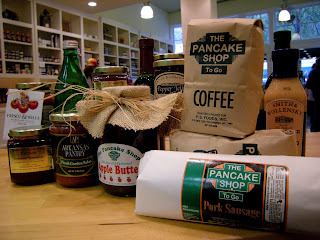 While you can’t take home the pancakes, you can bring home the restaurant’s famous apple butter, sausage, ham and drain-your-cup good coffee. RANGE: Apple butter’s $8.95 for a whopping 28 ounce jar, coffee’s $10.95 for 14 ounces and comes ground or whole bean, decaf or leaded. ONLINE: http://www.pancakeshop.com/. PHONE: (501) 624-5720. STORE: 216 Central Avenue in Hot Springs. PICKUP: Savory Pantry. A Gift Of (Not) Cooking For Christmas. Arkansas Flavor at Capital Bar and Grill.